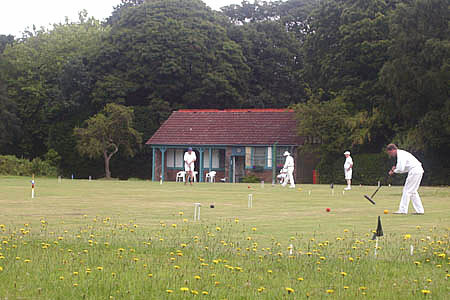 Liverpool Croquet Club was set up to provide facilities for playing the game, and a competitive and social environment for players of all ages and abilities. The club is located in Sefton Park, at the Mersey Bowmen Tennis Club, near Lark Lane and Livingstone Drive North. Thinking of taking up croquet, but not sure? Throughout the season, we run taster days for people who want to find out if croquet is for them, or for those who’ve played before and want to come and see what’s on offer. All equipment, training and advice are available, so just turn up any time between about 11am and 4pm for a game and a chat. There are no definite dates arranged for the next taster day, so just contact us if you want to come along, and we can make sure there’s someone around to chat to. If you’re interested, contact James Hawkins or just wander along to the club. The club was established at its current location in Sefton Park during 2010, and has use of what were previously grass tennis courts at the Mersey Bowmen Tennis Club, whose clubhouse facilities we share. The Mersey Bowmen Club was founded in 1781 – 89 years before the invention of tennis – and was originally an archery club. They were one of the first clubs to adopt the new game. They are now thought to be the oldest surviving tennis club in the world. (Edgbaston Archery and Lawn Tennis Society in Birmingham played its first documented tennis matches earlier in 1876 – a few months before the Bowmen – but that club itself only came into existence in 1860). Archery is no longer played, but the club can now claim to be one of the oldest surviving sports clubs of any kind, anywhere in the world. When the Bowmen first relocated to the newly opened Sefton Park in the late 19th Century, they had use of a large number of very high quality grass courts. Most of those were converted to a hard surface, and the remaining grass areas have seen less play. These are now being renovated, and reused for croquet. So far, two full-sized lawns are available, with plans to squeeze in another two over the coming few seasons.